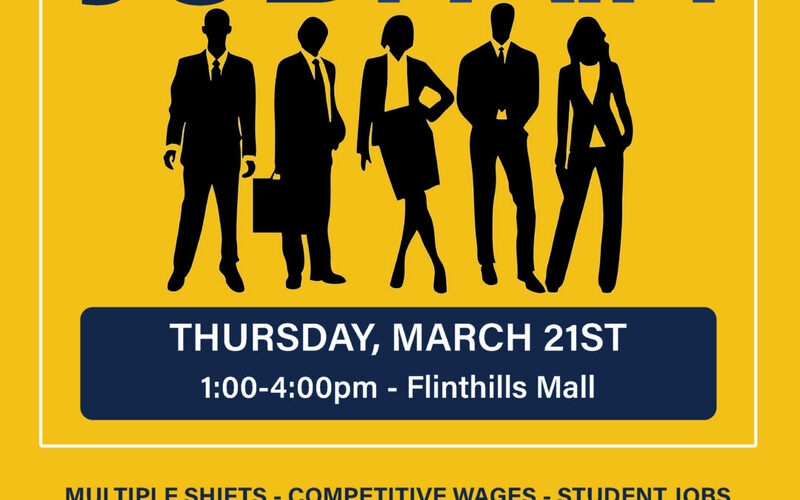 Emporia Spring Job Fair - 2019 - Southeast KANSASWORKS, Inc.
Southeast KANSASWORKS together with the Flinthills Mall will host the “2019 Spring Job Fair” on Thursday, March 21st at the Flinthills Mall in Emporia, Kansas. Over 40 employers scheduled to attend the event will have current job openings available ranging from entry-level and student positions to skilled, professional positions. Potential job applicants are encouraged to visit their local American Job Center office in Emporia to prepare for the job fair in advance. Job Center staff will assist individuals in resume preparation and review, interviewing skills and tips on how to “work the room” at a job fair. There is no cost for these services and advance contact with the job center is not required to attend the job fair. Some employers may conduct first-round interviews during the job fair, applicants should arrive with a supply of current resumes, be dressed professionally and ready to interview. Veterans and spouses of military members are encouraged to attend and will be identified as affiliated with the military. Many employers are seeking to employ military personnel in their business. If you have questions about the event or need assistance in preparing for the event, contact the American Job Center location in Emporia, Kansas at (620) 342-3355 or stop by the office.